In a fantastic location in the heart of the Peak District we are a perfect base to access the wonderfully diverse countryside and interesting towns/villages. We reside in the small village of Great Longstone where there are two pubs, a shop and a local park in walking distance. The Monsal Trail is accessible from the grounds; popular with walkers and cyclists this flat traffic free route travels 8.5 miles between Bakewell & Blackwell Mill near Buxton. The gritstone edges of Froggatt and Stanage are within easy reach. We are located in one of the most scenic areas of the Peak District. We have gentle walking on our doorstep in the form of the Monsal Trail an 8.5 mile stretch of disused railway. There are a variety of walks leading off the Monsal Trail which will enable circular routes back to our grounds. Book a weekend away in one of our accommodation buildings or camping, they are fully equipped and have a designated drying room (Lodge and Base Camp only) and boot storage area. We have several Orienteering courses on site suitable for all ages, a perfect way to get your children into reading maps in a safe environment. After a long days walk relax in your building or take a gentle stroll to one of the local pubs. 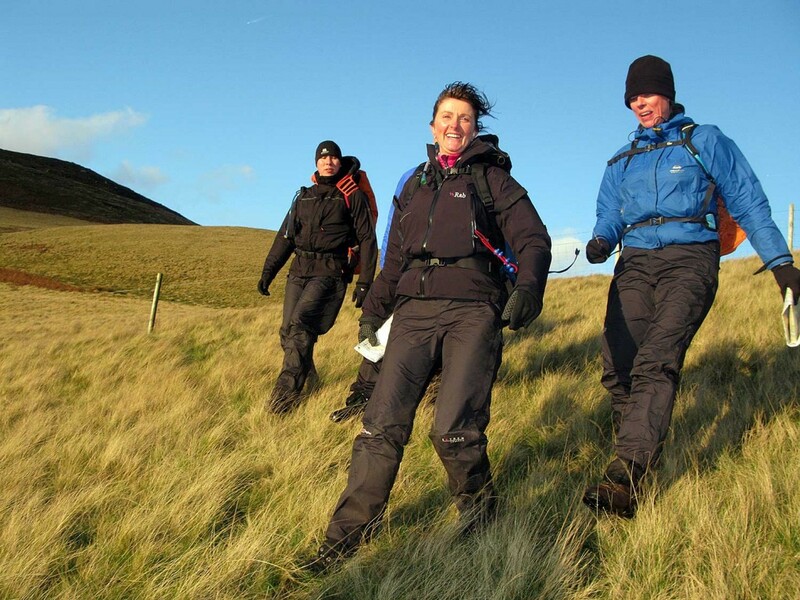 We can offer guided walks by one of our qualified instructors, alternatively you can book onto one of our walking qualifications to be able to lead a group yourself. Another idea is to combine your weekend with a walk on the Monsal Trail to Millers Dale and then Abseil off the bridge with one of our qualified instructors. Geocaching – a real-world, outdoor treasure hunting game using GPS-enabled devices. Participants navigate to a specific set of GPS coordinates and then attempt to find the geocache (container) hidden at that location. We have direct access to the Monsal Trail giving 8.5 miles of traffic free cycling with spectacular views of Monsal Dale and the thrill of the four newly opened tunnels along the way. There are plenty of mountain bike and road riding routes for all levels from our grounds, or a short drive away. Downloadable mountain biking routes – Choose your route where there is a map, further information and a downloadable GPS file. Downloadable road riding routes – Click on the map and choose your area or go to the list and choose your route (when you click on the route this will then open in a new window and there is a downloadable GPX file). British Cycling Events Calendar – A list of events within 30 km of Thornbridge Outdoors, events for everyone. Do you feel that some coaching would help your performance or you would like to be guided on a local ride? We can provide coaching sessions and ride leaders at all levels. National organisations also provide a range of opportunities: For young people just starting out the British Cycling Go-Ride programme could be just the thing, and dedicated women and girls sessions are also provided. Cycle qualifications can be gained in all cycling disciplines and at varying levels, the two main providers are British Cycling (all disciplines) and Cyclists’ Touring Club (CTC) (Mountain Biking). Whether you’re an experienced climber and/or caver, or new to the sports, there are a number of excellent crags and caves near to us. 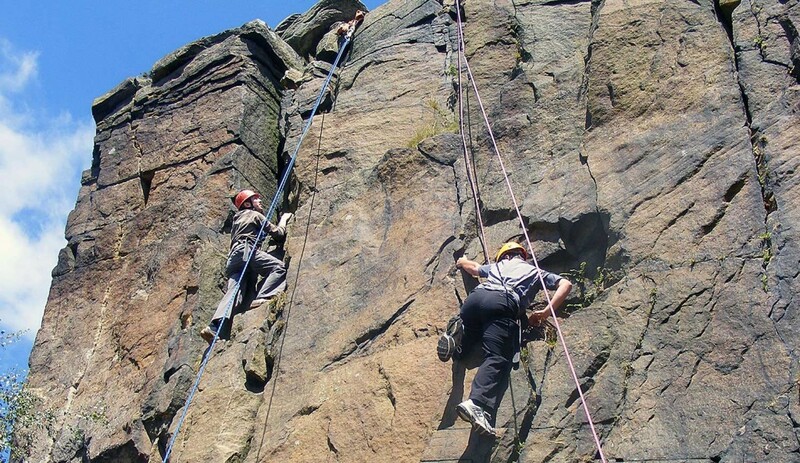 If you’d like a instructor to give you a rock climbing or caving experience, introduce new skills (such as leading or SRT) or help refine your skills please contact us. We have a kit washing area and drying room that groups staying here are welcome to use. Renowned for its puddings, street markets (which are still held in the town centre every Monday), thriving livestock market, historic buildings and riverside walks along the banks of the Wye. The town has a long and fascinating history – it was mentioned in the Dooms Day Book of 1805, ‘Badequella’ meaning Bath-well. There is a recreation ground with a child’s play area, 2 football pitches and a multi-use games area. 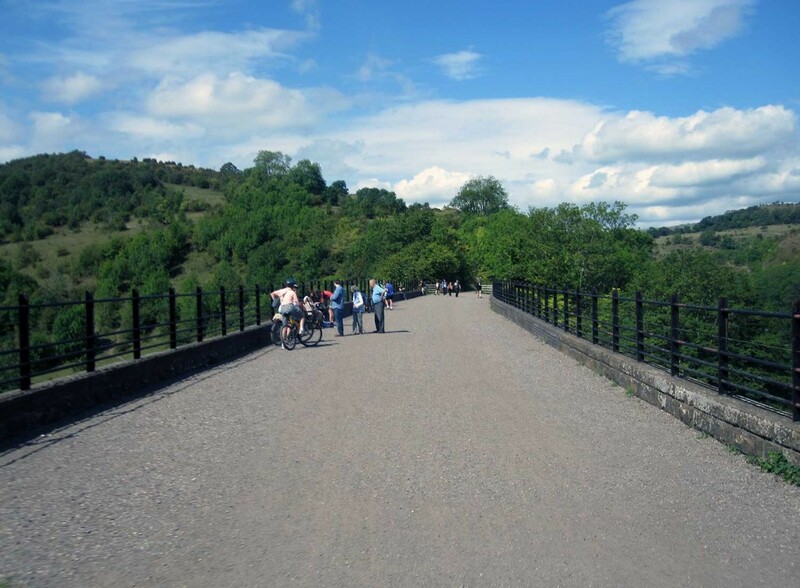 Its possible to walk or cycle to Bakewell (approx 5km / 3miles) along the Monsal Trail, a disused railway line which can be accessed directly from our grounds. Famous for the tragic epidemic of Bubonic Plague in the middle of the 17th century. You can visit the museum and many sites associated with the ‘plague story’ such as the Church and Churchyard, the houses where many victims died, the Cucklet Delf, the scene of the open-air services, Mompesson’s Well, the Boundary Stone, and the Riley Graves. A spa and market town popular with visitors to the area. Visit a museum where you can experience and wonder at the forgotten world of a Derbyshire lead miner. See the tools they used, clothes they wore, the advances in technology and the importance of this metal in our modern day lives. Various caverns, a castle, shops and excellent walking make this a popular tourist destination. Poole’s Cavern is a 2 million year old, natural limestone cave situated in the beautiful woodland of Buxton Country Park. One of the great caves of the Peak District. Haddon Hall is a fortified medieval manor house dating from the 12th Century. The magnificent home of the Duke and Duchess of Devonshire, Chatsworth House also has beautiful gardens and unique fountains and water features. Within the grounds is Chatsworth’s farmyard and adventure playground. It was the formidable Bess of Hardwick who first created Hardwick Hall in the late 1500s. In the centuries since then her descendants, farmers, gardeners, builders, decorators, embroiders and craftsmen of all kinds have contributed and made Hardwick their creation. There are 2 pubs in Great Longstone which are about a 5-10 minute walk away, The White Lion and The Crispin Inn. The Packhorse Inn in Little Longstone as also a 15 minute walk away down the Monsal Trail and across the fields. Remember to take a head torch for the walk home! In Ashford-in-the-Water there are The Ashford Arms and The Bulls Head. The Eyre Arms can be found in Hassop. The Monsal Head Hotel is easy to get to down the Monsal Trail and also has a pub next to the restaurant. At the old Hassop Station on the Monsal Trail there is the Hassop Station Cafe, Book Shop and Cycle Hire. Also at the old Miller’s Dale Station on the Monsal Trail there is the Miller’s Dale Cafe. Accessible Derbyshire is a brilliant website that lists loads of things to do and information about accessible places in Derbyshire and the Peak District. We have worked with Gillian and Jane from Accessible Derbyshire on the accessibility guide for our Woodlands accessible accommodation building.